Margaret was a victim of increasingly stringent attitudes toward recusants in the second half of Elizabeth I’s reign (1558-1603): Margaret was pressed to death just a year before the execution of Mary Queen of Scots for her role in a Catholic plot to overthrow the Elizabethan regime and two years before the 1588 Spanish Armada. The two officials who were tasked with carrying out the sentence allegedly employed several beggars to perform the job instead and Margaret was taken to the toll-both on the bridge that straddles the river Ouse where she was stripped and had a handkerchief tied over her eyes as a blindfold. She was then placed upon a rock roughly the size of a baseball or an adult’s fist and a large panel of wood (roughly the size of a door) was put on top of her and slowly loaded with 700-800 pounds of rocks and stones. In theory the smaller rock beneath her would break her back when the heavy rocks were piled on. Witnesses report that she expired within about fifteen minutes. Other victims of this punishment were not typically so lucky. For example, Giles Corey, executed in Salem in 1692, had weights slowly piled on him for a period of several days (being asked daily before more weight was added if he wished to enter a plea to the charge that he was a warlock) before he expired. Margaret was born Margaret Middleton in 1552/3, the daughter of a wax-chandler named Thomas and his wife Jane, the daughter of Richard Turner, an innkeeper. One of four children, she was born during the reign of Mary I (who has gone down in history with the unfortunate (but not entirely undeserved) appellation “Bloody” attached to her). A bit of background on the process of the various reformations in England is necessary to understand why Margaret’s Catholic beliefs were treated so harshly. Having broken with the Roman Catholic Church and founded the Anglican Church in the 1530s through a legislative reformation designed to assist him in securing the dissolution of his marriage to Catherine of Aragon so that he could wed Anne Boleyn, Henry VIII saw many of his religious policies undone by his heirs. He was succeeded on the throne in 1547 by his son (with his third wife, Jane Seymour), Edward VI, who made England into a more recognizably Protestant state than Henry appears to have intended (while Henry was interested in reforming stances, he appears to have identified most strongly with Catholic principles and geared his reformation toward abolishing the authority of the Pope in English ecclesiastical affairs, rather than changing beliefs and practices). Edward was, however, a short-lived king, having died in 1553 after but six years on the throne. He was succeeded by his half-sister Mary (daughter of Henry’s first wife Catherine of Aragon) who was a devout Catholic and spent much of her reign steering England back into the port of Catholicism — a task which involved martyring approximately three hundred of her subjects for their Protestant sympathies. Mary, in turn, was succeeded by Elizabeth, the daughter of Henry’s second wife, Anne Boleyn. Elizabeth was of a Protestant mindset and reinstituted the Anglican Church. Though initially reluctant to persecute people for their beliefs (she expressed herself as having no desire to “make windows into men’s souls”), political circumstances involving a plethora of plots on the part of Catholics (both real and perceived) against the Queen resulted in a hardening of attitudes. While fines and penalties were in place for non-attendance at Church of England services, the regime also began to enforce strict penalties against those found guilty of sheltering priests and Jesuits. And it was to these laws that Margaret fell victim. On July 1, 1571, when she was about eighteen years old, Margaret wed John Clitherow, a local York butcher and a widower with two sons. The number of children borne by Margaret to her husband is unknown; in addition to her stepsons William (1563-1636) and Thomas (d. 1604), she bore Henry (b. 1572) and Anne (1574-1622) and there is mention of other pregnancies but the details do not survive. In 1574, when she was twenty one, Margaret experienced a spiritual awakening and converted to Catholicism. While her husband did not join her in converting, members of his family also held Catholic sympathies and he was not unsupportive of her conversion, with the exception of one recorded incident when he railed against Catholics while drunk at a banquet. Margaret soon became highly involved in northern England’s underground Catholic community. She regularly held masses in her home in the Shambles (where she assisted her husband with his business) and her son, Henry, traveled to Rheims (a Jesuit centre) to train for the priesthood. Inside her home, Margaret created a series of architectural features to facilitate the concealing of priests, including a priest hole and a hole which was cut between the attics of her house and the adjoining house which could be used by a priest to escape in the event that the house was searched. Inevitably Margaret’s involvement with the local Catholic community drew official censure, and from 1576 onwards, John Clitherow incurred regular fines for her refusal to attend Church of England services with him. She was also imprisoned several times for her refusal to conform, serving three separate terms in York Castle as a recusant (August 1577 – February 1578; October 1580 – April 1581; March 1583 – winter 1584). 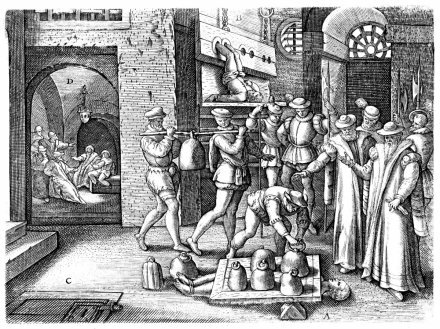 Once released, despite her efforts at concealment, on March 10, 1586 Margaret was arrested for harbouring priests (which, in 1585 had been made a capital offense). In a search of her house, a frightened child had revealed the location of a secret room containing Catholic paraphernalia and designed to shelter a priest. After her arrest, Margaret was jailed and on March 14 she appeared at the assizes. Although she was repeatedly asked to plead, she refused a trial by jury and thereby incurred the penalty of peine forte et dure: being crushed or pressed to death. Margaret maintained that her refusal to plead was a measure to prevent her children and servants having to testify against her and also served to protect the souls of the jury which would find her guilty. It is very likely that she also wanted to protect other local recusants who had assisted her and desired to prevent the revealing of their identity, which a trial would have uncovered. However, many contemporaries simply thought her mad and wondered at her seeming indifference to her husband and children — and Margaret’s willingness to abandon them for martyrdom. Yet, despite her imminent death, Margaret allegedly did not forget her family in her final days and reportedly sent her hat to her husband and her hose and shoes to her daughter, Anne. Some people, including her father-in-law, engaged in scurrilous mongering and postulated that Margaret’s willingness to die stemmed from guilt over an illicit encounter with her confessor, whose child she now carried. Such views, however, did not attain much popularity. After her sentencing, she was visited by several local Protestant preachers and kin, who endeavoured in vain to persuade her to plead guilty and throw herself on the mercy of the assize justices. She also appears to have been pregnant at the time as many people urged her to publicly admit her condition and thereby obtain a stay of execution. Margaret steadfastly refused to consider any of these things; she had embraced martyrdom. After her death, local family and friends (one of whom, John Mush, later authored a biography that remains the primary source for her life) found her corpse (buried anonymously as a criminal) and reinterred her in an unknown location in accordance with Catholic rites. After his wife’s death, John Clitherow married for a third time and remained a convinced Protestant until his own death. The couple’s children, however, embraced their mother’s Catholic faith. Anne Clitherow was briefly imprisoned in 1593 for her refusal to attend Church of England services and eventually became a nun at the convent of St. Ursula’s in Louvain in 1598. Henry (the son who had traveled to Rheims) studied first to be a Capuchin (he joined that order in 1592) and then to become a Dominican. He died, possibly insane, without having firmly settled on an order. Margaret’s stepson, William, became a priest in 1608, and her other stepson, Thomas, a draper, was imprisoned for his recusancy. He died in Hull prison in 1604. 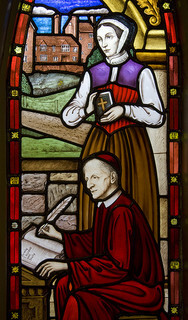 Margaret’s work for the English Catholic community and her martyrdom resulted in her canonization in the twentieth century. She was beatified in 1929 and canonized in October of 1970 — one of the Forty Martyrs of England and Wales. After her execution, somebody apparently chopped off her hand to preserve as a relic at the Bar Convent in York. Margaret’s feast day in the current Roman Catholic calendar, together with that of the other thirty-nine English martyrs, is May 4 — although in England it is celebrated on August 30. * Editor’s note: the trial could not begin without a guilty/not-guilty plea, so pressing was a means of forcing a mum defendant to the bar. Brute force often succeeded in extracting the necessary plea; however, because death by pressing preceded trial or conviction, a defendant hardy enough to undergo that fate could use it as a means to skip to the “execution” without suffering the other pains of criminal conviction. In Margaret’s case, she avoided the potential implication of other furtive Catholics at trial; in Giles Corey’s case, he avoided forfeiting his property upon the inevitable witchcraft conviction, and passed his estate to his heirs instead.